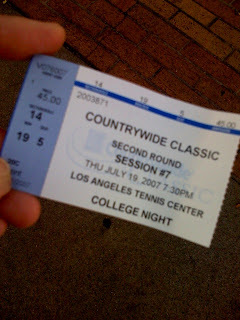 Yvette Foley, my co-worker at SAG invited me to watch tennis at UCLA, LA Tennis Center. I had a great time watching James Blake almost losing to Paul Goldstein after winning the first set convincingly @ love. Then the table turned around and Blake lost the 2nd set quickly 6-1. They were neck to neck in the 3rd set and Blake had many chances to break Goldstein but he couldn't close the deal. In fact, he was down a match point at 5-6. Fortunately, Blake served a great 2nd serve wide and pulled Goldstein off the court, and followed with a forehand crosscourt winner. He then broke Goldstein next game, and served 4 aces the following game to win the match. What a "nail-biter"!